Vitiligo is the most common of the depigmentation disorders. 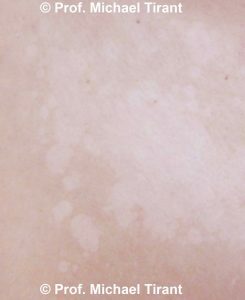 It is an acquired pigmentary disorder of the skin and mucous membranes, in which there is a loss of melanocytes or pigmentation, producing irregular white spots and or white patches. How many people are affected by Vitiligo? Approximately 1 to 2 % of the world’s population is affected by vitiligo, equating to 40 – 50 million people. Some reports suggest that incidence of Vitiligo in India, Egypt and Japan is higher; possibly up to 6% of the population may be affected. The condition occurs independently of age and race, with both sexes affected equally. In approximately half of all cases, Vitiligo appears before the age of 20 years, and 70-80% of patients will develop the condition prior to the age of 30. 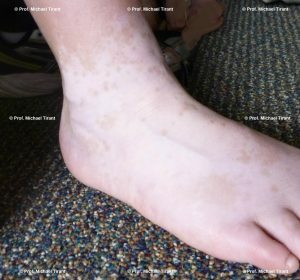 Is Vitiligo associated with other diseases or conditions? Patients with Vitiligo are also known to suffer from other autoimmune conditions such as thyroid disease (12.3% of patients) and alopecia areata (3.8% of patients) as well as discoid lupus, Guillain-Barre syndrome, linear morphea, myasthenia gravis, pernicious anemia, Sjogren syndrome, systemic lupus erythematosus (SLE), rheumatoid arthritis, inflammatory bowel disease, psoriasis, and diabetes type 1. Both genetic and non-genetic factors are believed to be involved in the onset of Vitiligo and although several theories have been proposed as to the cause of Vitiligo, the exact mechanism causing the destruction of the melanocytes remains unknown. The hypotheses discussed in various studies include genetic, immunological, neurohormonal, cytotoxic, biochemical and oxidative stress. According to researchers the exact triggers of the condition vary widely patient by patient, thus making it difficult to conclusively define the primary cause. However, given that autoimmune diseases typically involve interactions between genetic risk factors and environmental triggering factors, the autoimmune theory seems to be the most plausible. 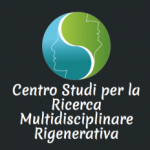 In Vitiligo, after the genetic component (approx 20 -30% have at least one affected first-degree relative) is taken into consideration the triggering factors are considered to be environmental i.e. poor nutrition, emotional stress, trauma (Koebner Phenomenon), drugs, infections, exposure to the sun and chemicals, toxins and sepsis. What is happening to the skin when you get Vitiligo? Vitiligo is the partial or complete loss of melanocytes from patches of skin (known as depigmentation). Melanocytes synthesize melanin from the amino acid tyrosine in a specialized pigment-producing organelle called a melanosome. The pigment Melanin is essential for the production of skin colour. Autoimmune/Inflammatory-mediated destruction of melanocytes causes depigmentation of skin and forms white spots or patches. Simply put the body attacks the melanocytes and destroys them, as the number of melanocytes decreases so does the production of melanin. As the melanin levels decrease the skin colour is affected and white spots or white patches are the results. The aim of our treatment is to address the immune system, rebalancing it and to reduce inflammation, allowing the body to regenerate the melanocytes in the skin. 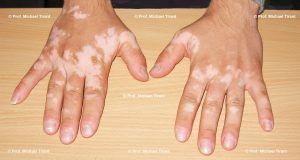 Is diet important in the progression of Vitiligo? As with other skin conditions dietary intake is very important in maintaining healthy skin. The idea that dietary intake of certain foods can impact upon the initiation and exacerbate skin conditions, such as vitiligo, is still controversial. However, more and more research is being conducted and published studies are now available that supports this important fact. 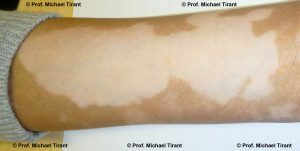 Researchers have proposed that histamine might act as a toxic mediator in the development of Vitiligo for some patients. 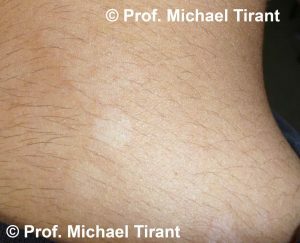 It has been observed that a number of vitiligo patients attending the Pigment Clinic gave a history of significant pruritus (itch) in their Vitiligo patches. 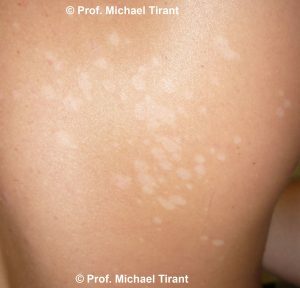 Even more importantly, many patients had a history of the spread of Vitiligo lesions that was preceded by itching in the new areas. Histamine is particularly relevant in this context since histamine, which is also liberated along with other chemicals when cells are damaged, is one of the chemical mediators of itch. Histamine is found in a number of foods and drinks, so abstinence or at the very least significant reduction of these foods may be beneficial for some vitiligo patients. When you have an Online Email Consultation the Consulting Practitioner will advise you of these foods. 1. Panja SK, Bhattacharya B, Lahiri SC. Role of Histamine as a Toxic Mediator in the Pathogenesis of Vitiligo. Indian Journal of Dermatology. 2013;58(6):421-428. doi:10.4103/0019-5154.119947. Are there different types of Vitiligo? 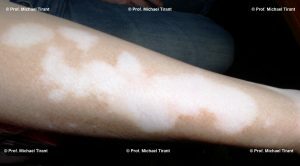 In most studies Vitiligo is broadly classified into four types, however, there is still some ambiguity and disagreement as to what should or should not be classified as Vitiligo or what should be classified as some other depigmented condition. Mixed NSV and SV – Approx. 6% of the above NSV patients will present with an SV lesion elsewhere on the body while approx. 19% of above SV patients had SV in combination with other types of vitiligo and 10% of these progressed to NSV. Unclassifiable types e.g., focal, multifocal asymmetrical non-segmental and mucosal at one site. Focal at the onset – refers to an acquired, small, isolated hypopigmented (white) lesion that does not fit a typical segmental distribution, and which has not evolved into NSV after a period of 1–2 yr.
Mucosal – typically refers to the involvement of the oral and/or genital skin. 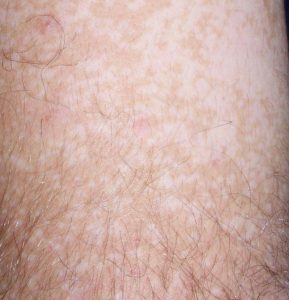 In NSV the lesions (white spots or patches) are usually scattered all over the body in a symmetrical distribution and the commonest affected site are the limbs. Generalized vitiligo (GV) usually begins later in life, at sites sensitive to pressure, friction, and/or trauma, and has a highly variable course with periods of progression (flare ups), remission, and stability. 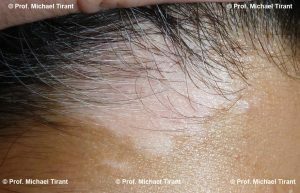 Loss of pigmentation in the hair (poliosis) may occur in the later stages. GV is often associated with a personal or family history of autoimmune conditions. SV typically begins in childhood, presenting most commonly on the face and tends to develop rapidly over short span of time in a localized area and then remain stable. Also SV is typically not associated with autoimmune conditions, or at least there is a significantly reduced association than in GV. Currently, there is no cure for Vitiligo and the emphasis of treatment is focused on stopping the progression of the condition and where possible to reactive the pigmentation process in the white spots or patches. The success of the reactivation of the pigmentation varies from patient to patient. The sooner a patient starts treatment the more successful the treatment is. Also, younger patients have a greater success rate. Like all skin conditions once activated it is with you for life, so triggers such as skin injury, stress etc. can reactivate the condition. What other skin conditions looks like Vitiligo? 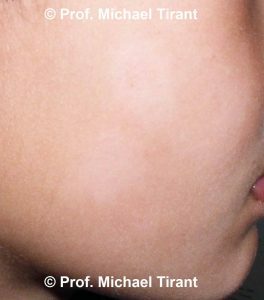 Hypopigmentation:- may result from a reduction of melanocytes or from an inability of the melanocytes to produce melanin or properly transport melanosomes. 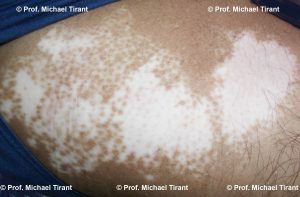 Whilst this also occurs in Vitiligo, hypopigmentation is also a secondary presentation or post an inflammatory response to skin injury, burns, laser, chemical peel reactions or as the result of psoriasis, atopic and contact dermatitis and other skin conditions such as Pityriasis alba, Tinea versicolour, lichen planus, lichen sclerosis. Psoriasis:- an inflammatory disease that commonly affects the scalp, torso, elbows, knees and fingernails. It is a non-contagious chronic disease that can cause great discomfort. It most commonly presents as sharply defined red, dry plaques of thickened skin covered by a silvery/yellowish, flaky surface. It can also present as a weepy or pustular condition. Pityriasis Alba:- A common skin condition with first presents as red, scaly patches usually affecting young children and young adults. As these patches resolve, areas of scaling hypopigmentation, or lighter colouration are left remaining. There patches usually resolve over time. The lesions can be round, oval or irregular in shape. Initially the lesions appear red, pink or skin colored. Usually one or more spots or patches may be observed on the face and/or arms; however the neck and torso may also be affected. The rash may last from several months to over a year. Lesions can also wax and wane. The lesions are very obvious on those with darker skin, whilst those with lighter skin will notice the rash more frequently during the summer months as their skin tans. 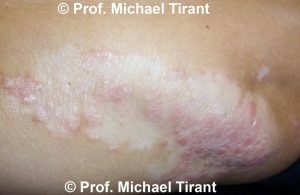 Tinea versicolor:- a common, benign, fungal infection usually characterized by hypopigmented or hyperpigmented macules and patches on the chest and the back, though sometimes the arms and thighs can also be involved. It is an autoimmune response to a fungus on the skin. The spots and patches can be either lighter or darker than the surrounding skin. The color of the spots and patches vary and can be white, pink, salmon, red, tan, or brown. The fungal infection can frequently reoccur. 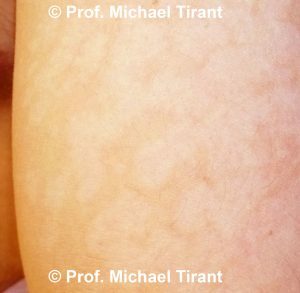 So how can you tell Pityriasis alba, Tinea versicolour and Vitiligo apart? 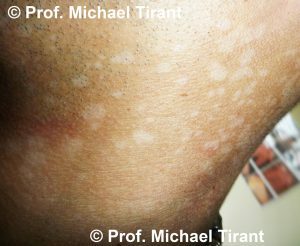 Pityriasis alba can quite easily be confused with tinea versicolor. If in doubt the diagnosis of tinea versicolor can be ruled out by a KOH examination, which involves scraping a small amount of the surface flakes onto a glass slide. KOH is added to the scraping and the slide is viewed under the microscope. Fungal elements can be seen under the microscope with tinea versicolor but not with pityriasis alba. 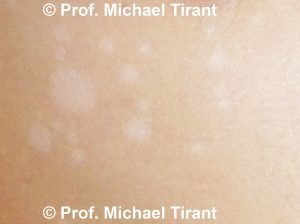 Pityriasis alba and Tinea versicolour can also be distinguished from vitiligo by the border of the lesions. 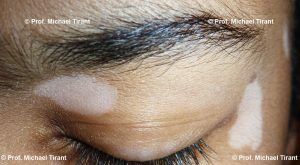 Vitiligo has a very distinct border with a sharp line between normal and lighter-coloured skin, whereas the Pityriasis alba and Tinea versicolour lesion boarder can be less well defined. Cosmetic options e.g. makeup, a self-tanner and skin dyes. A relatively safe way to ensure vitiligo less noticeable. Often recommended for children as it avoids possible side effects from medications such as corticosteroids. However it is time consuming and must be repeatedly applied, it also takes a lot of practice to achieve natural-looking result. 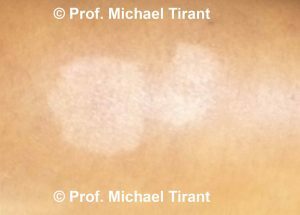 ultraviolet B (UVB) light from UVB lamps is the most common treatment for vitiligo. This is usually combined with a topical cream e.g. psoralen, a photosensitizer, or with an immunomodulant – either systemic (oral) or injectable. The treatment can be carried out at home with a domestic UVB lamp or in a clinic. It is important to control the exposure time so that the skin does not burn from over exposure. Treatment may take up to 3 -4 weeks providing the spots are on the neck and face have not existed for more than 3 years. If the spots are on the hands and legs and they have existed for more than 3 years, it may take several months of treatment. In a clinic the treatments are conducted 2-3 times a week, and at home every day. 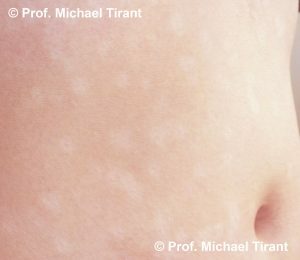 Spots on a large area of the body may require full body treatment in a clinic or hospital. Also another common treatment is the prescribed potent or super-potent topical corticosteroid. Approximately half, 45 percent, of patients regain at least some skin color after 4 to 6 months. The topical corticosteroid may be combined with another medicine to improve results. Corticosteroid works best in people with darkly pigmented skin. May not be suitable for treatment of white spots or patched on the face. Long term use of corticosteroids can result in significant thinning of the skin. Ointments containing Tacrolimus or Pimecrolimus (calcineurin inhibitors) may be effective for people with small areas of depigmentation (white spots or patches), especially on the face and neck. This treatment is considered to have fewer side effects than corticosteroids and can also be used with UVB light. It should be noted that the Food and Drug Administration (USA) has issued a warning about a possible link between these drugs and lymphoma and skin cancer. Skin grafting – small pieces of normal, pigmented skin are removed and attached/ embedded into the areas where the pigment has been lost. This procedure is suitable only if you have small spots or patches of vitiligo. Drawbacks include the potential for infection, scarring, a uneven or spotty appearance, and failure for the skin grafts to take or to stimulate regimentation. Blister grafting– small blisters are induced on your pigmented skin, usually with suction. The Doctor then removes the tops of the blisters and transplants them onto the depigmented skin. 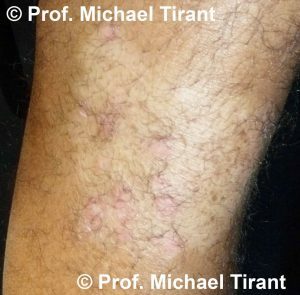 Drawbacks include the potential for the Koebner Phenomenon (skin injury) to trigger new patches of vitiligo, scarring, a uneven or spotty appearance, and failure for the skin grafts to take or to stimulate regimentation. Tattooing (micro-pigmentation). Best performed by a doctor who uses a special surgical instrument to permanently colour the skin. Usually most effective in and around the lips in people with darker complexions. 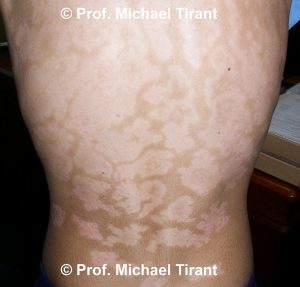 Drawbacks include the potential for the Koebner Phenomenon (skin injury) to trigger new patches of vitiligo. Also it can be difficult to exactly match skin tones. This treatment is usually considered only if your vitiligo is widespread and all other treatments haven’t worked. A depigmenting agent is applied to the unaffected areas of your skin. The skin will gradually lighten so that it blends with the white patches. This treatment is applied once or twice daily. Depigmentation can take 1 to 4 years. Who are famous people with Vitiligo?